The tale of our friend Joan’s bees began almost exactly two years ago. Much has happened since. Here I told you about the epic-sized swarm her first hive spun off. After that the hive continued to produce more swarms, and these are the bees that Joan got to replace her swarmed-out hive. Joan’s glorious garden is surely one reason her bees thrive. Two days ago, one of her hives swarmed again. 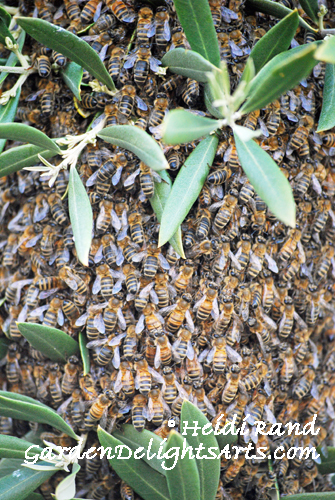 Rather than staging their journey from the olive tree, where most of Joan’s swarms head first, this one congregated on the stone border around the tree. It was a relief to have a ladder-less swarm capture for once. Joan tried to entice them into a box with some tasty honey and comb, but although they eagerly ate the honey they weren’t ready to move into the box. 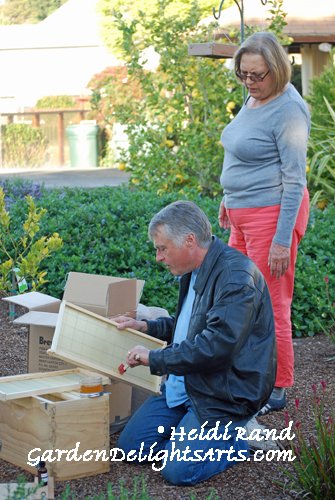 George and I brought over more temptations: bee lure and an extra-fancy beekeeper’s box. Okay, that’s just a cardboard banker’s box all duct-taped-up with one side handle left open for the bees to enter. The bees were interested, but moving slowly because the weather was cooling. We beekeepers were patient, but only up to a point. Joan and George decided to suit up to help the swarm along. Those lingering in the rocks started marching up to join their sisters. Until finally the whole swarm was tucked into the box. And on to their new home. But that’s a story for another day! George and I got the buzz through the beekeeper’s grapevine that there were some honey bee swarms under the BART elevated tracks. A portion of the structure beneath the tracks is hollow, and we’ve heard that there are beehives throughout much of the outdoor BART system. Although we figured the swarms probably had found new homes, we ventured over yesterday afternoon to see. Yowza! 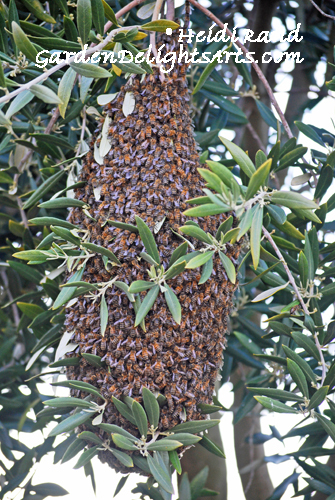 This is NOT a swarm – it’s a colony of honey bees that built their comb down from a hole in the structure. You don’t often see “fresh-air” beehives. I’m not even sure whether you can call them hives, since they’re not inside a structure. Regardless of the proper name, it’s a natural sculpture of staggering beauty. There are seven frames, and it’s about 2.5 feet down and 3 feet across. It’s opposite an apartment complex, and one young woman yelled over to us, “You’re not taking our bees, are you?” It turns out she and her housemate love bees, and they’ve been watching over the colony for a year and a half, so it has survived through a month-long cold snap and the hard rains we’ve had recently. We told them no, we were definitely not going to disturb the fresh-air colony, but we were trying to gather up a small swarm that had separated from it, which was hanging down from another nearby hole. When we first saw the swarm I was looking up to photograph it, when George noticed just in time that there was a pile of bees on the ground right where I was going to step! We were sure they had fallen from the swarm because they were directly beneath. Hoping that the queen might be in the swarm on the ground, we had zoomed home to get our beekeeper suits and a nuc box (a small wooden box with frames to keep bees in temporarily). George smeared some honey comb onto frames – yum – and placed it next to the bees on the ground, and they immediately started marching onto the frames. They filled it up really quickly! George put the frames in the nuc box. The bees on the ground marched inside, and some flying around landed and joined them. A bunch of them began “fanning” on the front landing strip, which George hoped meant that the queen was inside. When a worker bee fans she stands with her backside facing out, fans her wings and releases pheromones to direct the rest of the swarm to the colony. At one point clumps of bees began dropping from the swarm! One clump hit the ground, but most of them separated and swirled around. As it started to get dark we were bent over the front of the box to make sure they all got in. Another clump of bees fell, some of them onto our heads! George had his suit on but I didn’t. Swarming bees are usually very calm and sweet, their sole aim is to protect the queen, so unless you do something to really upset them they won’t sting. I was around them for hours that day without a suit and I didn’t get stung once, not even by the ones that fell on my head. After the ones that fell marched in, we sealed the nuc box and brought the BART bees to their new home. Today was wonderfully warm, and the new bees were busy coming and going, checking out the ‘hood. Time will tell whether we got her Majesty, the queen. Our friend Joan has a hive of bees that originated from a swarm we gave her a year ago. Joan’s bees are going gangbusters. 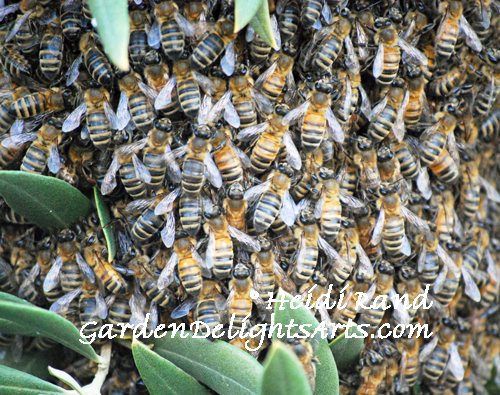 Last week a huge swarm the size of a large child separated from her hive. Joan said, in her wonderful Southern accent, “George, you could put your arms around it and give it a hug.” I couldn’t go along to help George and Joan gather that swarm, but when the phone rang early yesterday afternoon and Joan said, “Guess what!? It happened again,” I had my beekeeper’s suit and camera loaded into the car before she hung up. 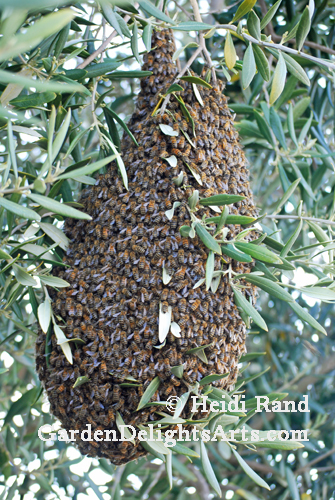 They were in Joan’s olive tree (the last swarm traveled to her neighbor’s yard, causing a bit of consternation). This swarm was tiny in comparison to last week’s, a bit over a foot long and maybe half a foot wide. 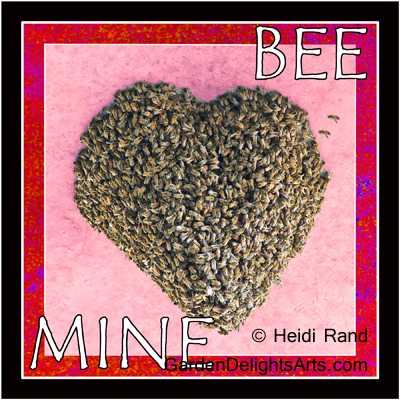 I could get close with no worries – honeybees generally don’t sting if you leave them alone while they’re swarming. They are intent on protecting their new queen (she’s in the center of the swarm), with a few peeling off to to scout for their new home. Here’s more of a close-up. They were lined up in neat rows, and holding tightly to one another. George thought it would be least disruptive if he could get them to fly voluntarily into the box that he had brought to transport them, called a nuc or nuc box. It’s basically a smaller version of a normal Langstroth hive, ideal for transporting a swarm (unless it’s as big as a small child). The term nuc comes from the fact that the swarm is gathered around the queen — the nucleus of the honeybee colony. To make the box appealing to the swarm, George took a few of the frames that fit into the nuc box and coated them with honey that Joan harvested from the hive last year. He also added some drops of “bee lure,” which is a mixture of scents used to attract bees. Joan supervised. We waited about an hour, but although some of the scouts did enter the nuc, there was no mass movement into it. 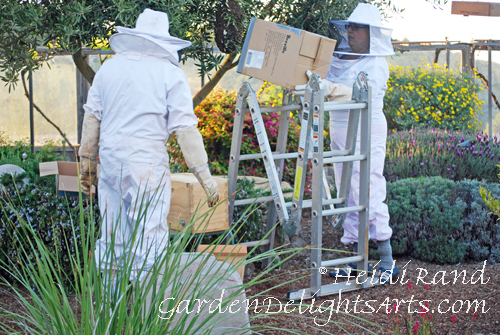 As dusk approached, we decided to suit up and move the bees into the box. George and Joan clipped some of the twigs that were in the way, then carefully cut the main branch and placed the swarm into their new temporary home. George will go back this evening to make sure that all of the stragglers are in the box, then he’ll seal it up and bring it to a friend who needs a hive because hers died over the winter. Happy Valentine’s Day everyone! This is the card I made for my Valentine, my wonderful husband George. Hoping that your day is filled with sweetness and honey!